Tigerwood is one of the finest quality hardwoods available. 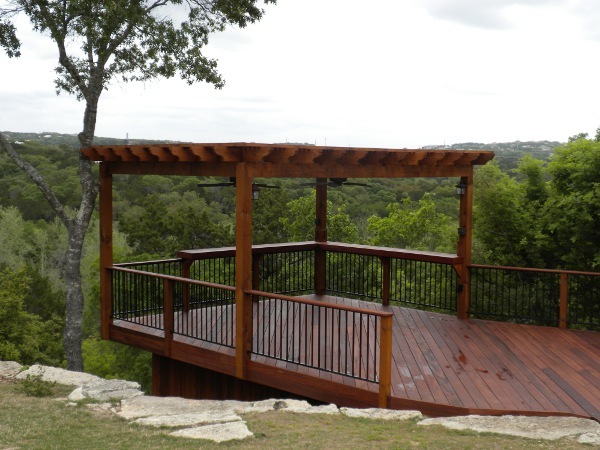 Here in the Austin area, Tigerwood is a top choice for our customers for their decks, pergolas, covered patios and various other outdoor structures. Lots of our customers are now asking for hard woods for their exterior projects. Hardwoods are extremely durable and have very long lifespans. Tigerwood has a 25+ year lifespan. That means that in many cases, your deck will still be standing after you may have moved to a new home. Tigerwood is a very dense hardwood. As a matter of fact, if you drop tigerwood into a pool, it will sink. It’s very dense and very strong. What accounts for Tigerwood being in such high demand? Tigerwood is an exotic extremely durable Brazilian hardwood. It features a unique light golden-brown to reddish-brown coloring with exotic black and brown streaks. This is where it gets its name Tigerwood because of the coloring and unique but subtle stripe pattern. Tigerwood is responsibly harvested from managed forests to provide a truly renewable resource. It’s naturally resistant to rot & decay and will not attract mold and fungus. You may have heard of IPE. IPE is also a Brazilian hardwood but it has no additional benefits and is significantly more expensive. 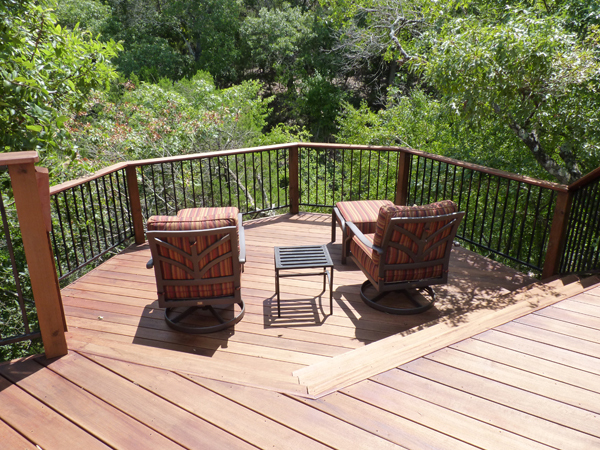 I want to show you one of the Tigerwood hardwood decks we recently built in Barton Creek. Here’s Mark Mommsen showing you the deck and talking a little about the project. 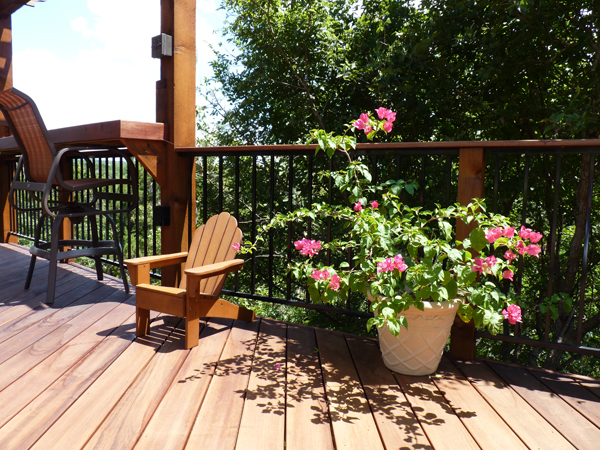 The deck includes multiple “living areas”. In the video, Mark is talking about standing in the lower octagon. That area was made as a quiet sitting area overlooking the canopy of the trees. 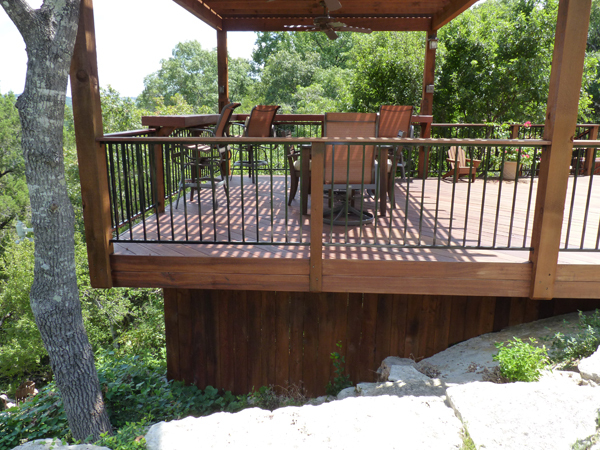 This deck is actually built on a very steep slope that quickly drops off to a creek running down below. The second living area of this deck is the outdoor fireplace area. The third living area on this deck is the pergola section which includes a bar, electricity, ceiling fans and a great deal of seating area. Over in the middle area between the outdoor fireplace and the pergola section can be used for another sitting area or just to give some breathing room between the multiple living areas on the deck. What you’re looking at above is the seating and covered pergola section of the deck. You can see the extremely steep drop-off to the left side. From the entire deck area, you can hear the stream trickling below. Above, you see the deck furnished and it’s easier to see the extended bar area around the perimeter of this section of the deck. You can see how large of an area this is since they are able to fit both bar stools and a table. The photo above shows the reading area portion of the deck. The area is separated by stairs to put the seating/reading area on a different elevation. This helps create privacy and a feeling of being in a separate living space. Finally, above you’ll see the deck area between the pergola/eating area and the quiet lower reading and sitting area. Give us a call for a free quote on your next project. (512) 259 – 8282. This entry was posted on November 28, 2010 by austinporchandpatio. It was filed under Decks, Hardwood Decks, Materials, Tigerwood and was tagged with Austin tiger wood decks, Tiger wood, Tiger Wood decks Austin, Tigerwood, tigerwood decks austin.